Anne combines a number of modalities to move with clients through their healing journey, which she believes is directed by our higher selves. She is certified in Level 1 Neurokinetic Therapy; she is a Level 3 Fascial Stretcher, trained through Stretch to Win; she is a Certified Yoga Therapist with the International Association of Yoga Therapists; she is a yoga instructor and continuing education provider with the Yoga Alliance, specializing in alignment, therapeutics, restorative yoga, and chair yoga; she is a certified Yoga TuneUp® instructor and uses myofascial release products to assist with greater mobility and freedom; she is a Reiki Master in Usui and Karuna lineages; and she has a Masters in Social Work from the University of Pittsburgh and an undergraduate degree in music from Brown University. Anne has been teaching yoga and working with students in northeastern Ohio for a decade. ​Before yoga, Anne played the cello, wrote and investigated as a newspaper reporter, and for 20 years worked as a community outreach social worker. In yoga she found what she’d been looking for – a practice that offers a more functional, compassionate, and happy life! 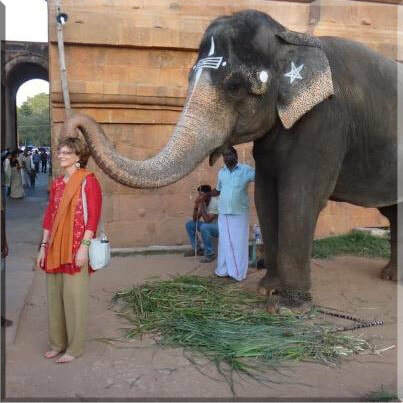 Anne being greeted during a visit to a Hindu Temple in Southern India! Anne’s posture and alignment work is based on the principles of Iyengar yoga garnered through her studies with Ginny Nadler (Core Body Wisdom); Peggy Cappy (PeggyCappy.com); Judith Hanson Lasater (JudithLasater.com); and Doug Keller (DoYoga.com). Anne teaches restorative yoga and studied at the advanced level with Judith Hanson Lasater, author of Relax and Renew. She teaches chair yoga and trains with Peggy Cappy, author of Yoga for All of Us. Anne leads a restorative yoga teacher training program, Sacred Calm, as well as a chair yoga teacher training, Restful Mountain. Anne is a Yoga TuneUp® certified instructor (YogaTuneUp.com), which focuses on anatomy and uses Yoga TuneUp® balls for fascial release in all of her classes and private sessions. She is also a Level 3 Fascial Stretch Specialist, certified through Stretch to Win, the miraculous brainchild of teachers Ann and Chris Frederick (StretchToWin.com). Anne teaches anatomy, therapeutic, and restorative modules at Awaken Yoga’s Teacher Training School as well as at other teacher training programs. She also leads workshops focusing on anatomical principles for building a stronger and safer yoga practice. Anne studies meditation and is an Usui and Karuna Reiki Master, having trained with Rowan Silverberg. She completed Level 1 iRest Training, or Yoga Nidra, with Richard Miller’s Integrative Restoration program (iRest.us). In January 2013, Anne took a life-changing chanting pilgrimage to Southern India with Russill Paul (RussillPaul.com). Anne is deeply grateful to all her teachers, who most especially include her students, for their generous sharing and continued exploration of the practice and principles of yoga.